It took seven Halos, but I finally feel like a Spartan. While both salmon and tilapia are kinds of fish, they are distinctly different in both taste and texture. The same can be said about video games. There are genres of games that have simply defined themselves as a distinct place within it. While they are still first person shooters at heart, we often describe a game as like DOOM, like Call of Duty, or like Halo. There’s something distinct about these flavors of games, that when another game implements its formula, you get that distinct feel. Halo 5: Guardians continues to feel like a Halo game, and in fact, it may be the first Halo game that fulfills the promising of feeling like a Spartan. But it may be the furthest game from the core Halo experience yet that we’ve come to define what a Halo game is. Halo 5: Guardians is a distinct change in a lot of ways from previous games, in a way it’s part Halo 3: ODST and part Halo Reach, a direct sequel in style not story. The game is built around its four player co-op missions, with either players or AI taking up the roles of the different Spartans. This time there are two sides of the story to tell, so you’ll drop into the shoes of Osiris Team led by Spartan Locke (a former Oni special agent); or you’ll play as Blue Team led by the indomitable Master Chief. Sadly if you are hoping to play as Master Chief for most of the game, that’s not the case, as about a quarter of the missions involve Blue Team. 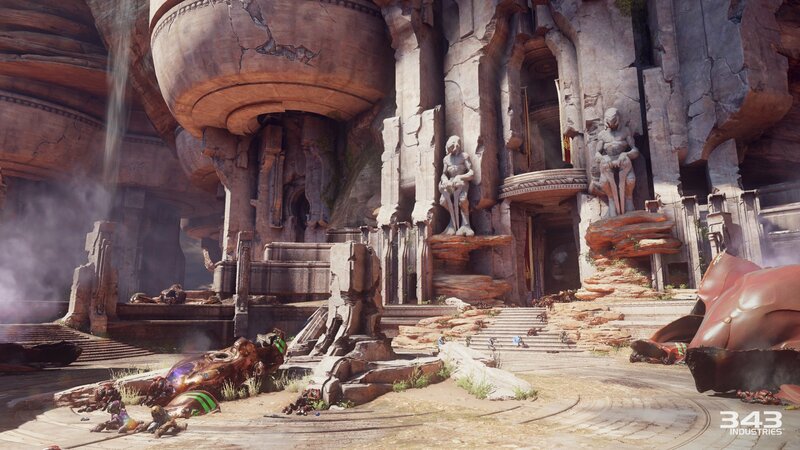 Instead players are left with a piece of the story of Blue Team which is unveiled unveiled from Osiris’s perspective as they pursue Master Chief. Fundamentally the Spartans all behave and feel the same. In co-op you’ll start with different weapons depending on the character chosen, but the actual movement speed and everything else is identical. Every character does have a unique HUD, which is a nice touch, and each one is fully voiced. The dialogue and voice acting is definitely top notch here, with plenty of humor injected just to keep things light despite the possible demise of all humanity. Nathan Fillion reprising his role as Buck is mostly this comedic relief character, but there are other moments. The enemy dialog is also a highlight, with the grunts playing the jester role once again. 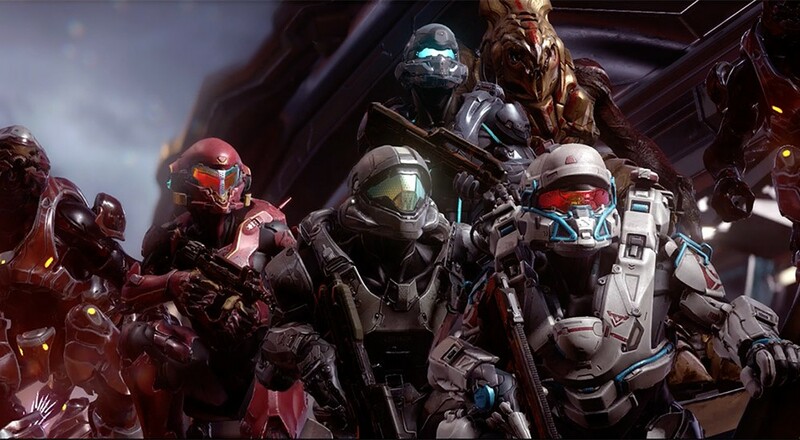 If you’ve followed the Halo franchise over the years, you know about the legendary Spartans. Bio-mechanical hybrids of men and women crafted by Dr. Halsey to complete the impossible. They are promised to be big, badass, and powerful but also fast and agile. If you played last year’s Halo: The Master Chief Collection you know how every Halo game felt different. It was jarring if you pieced together a playlist across different games. You’d jump higher in one game or run faster in another. You could dual wield in one game, but not the other. All along you never quite felt like what a Spartan was promised to be, that is, until Halo 5. The most obvious addition is the ability to grapple ledges quickly and pull yourself up, combined with quick thrusts, sprints and charges - you’ll feel like a 2 ton pickup capable of parkour. It’s because of this change that level design has gotten a huge upgrade. Levels are just as much vertical as they are horizontal. There are alternate routes to discover, either left right up or down, that help you flank enemies and achieve combat success. When you combine that with the three other players it feels downright surgical at times - it’s definitely “Halo combat” evolved. Not only are the levels more varied in their design, but they feel bigger and more alive. Huge battles between Covenant and Forerunners are taking place everywhere. Lumbering guardians tower in the background, and new gigantic ships that make the Covenant Scarab look like a toy car come to life. It’s truly impressive, especially considering the game is a silky smooth 60FPS the entire time.